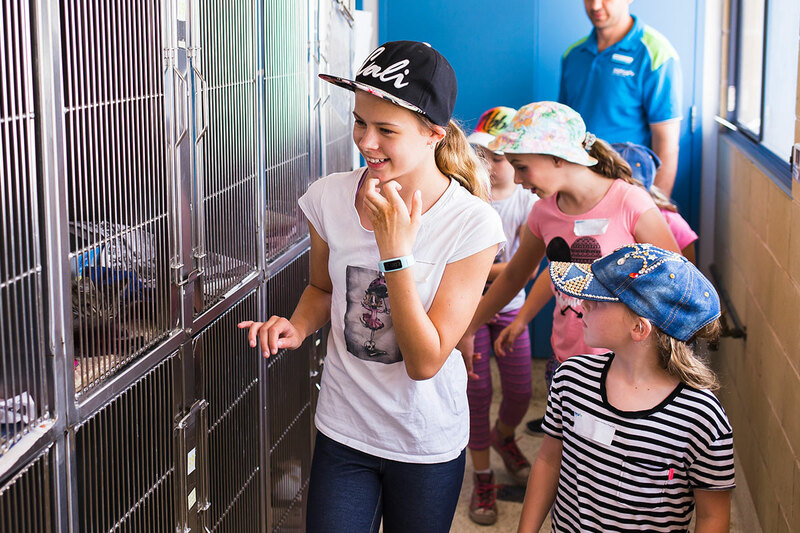 Our School Holiday Program is an opportunity for children and teens to spend either a half or full day at an RSPCA NSW shelter or Care Centre. The school holiday program sessions are held at the Blue Mountains Shelter, Illawarra Shelter, Hunter Shelter, Sydney Shelter and the RSPCA Care Centre Tuggerah. Participants will have a chance to get up close and personal with cats, dogs, ducks, pocket pets, and maybe even the occasional donkey! Programs and locations are seasonal. During summer and winter school holidays, programs are held at the Hunter Shelter and Sydney Shelter. Autumn and spring sessions are held at the Blue Mountains Shelter, Illawarra Shelter and the RSPCA Care Centre Tuggerah. Sessions are tailored to specific age groups: 8-11 years, 12-14 years and 15-17 years. If you or someone you know would like to spend their school holidays making some new furry friends, book a session by clicking your selected date below and get started on your adventure today! Please note: Our shelters use peanut butter as part of the enrichment program for the animals. If your child or children have allergies, or you have any concerns, please feel free to contact the Education Team on (02) 9782 4478 prior to registering. For more information on each of the sessions, please see below. No one ever wants to feel bored, and that’s especially true for our shelter animals at RSPCA NSW. Come along to learn the secrets behind our enrichment regime for companion animals and how to help pets exhibit their natural behaviours at home. Put your thinking skills to the test by creating enrichment toys for the shelter dogs, cats, rabbits or birds! At any one time there can be dogs, cats, rabbits, guinea pigs, sheep, goats, horses, chickens, ducks or even a donkey or two seeking shelter at RSPCA NSW, waiting to find their forever home. We would like to invite you to spend a day at our shelter learning about what goes on behind the scenes and lending us a helping hand to make sure you and our animals have the best day ever! If you are interested in working with animals but aren’t sure where to start, sign up for this program and explore the various careers within the animal industry at RSPCA NSW. You’ll have an opportunity to meet several experts in the field and engage in tasks to get a hands-on experience with different roles. Training for our pets doesn’t stop at puppy preschool. It should be an ongoing journey to keep them mentally stimulated and show off how intelligent they really can be! This workshop will give you insights into dog and cat body language and behaviour, as well as provide you with a firsthand experience in the positive training techniques used by RSPCA NSW. Would you know what to do in an emergency situation if your pet was injured or in an accident? Learn what it takes to keep your cool under pressure and hear advice and information on steps to help your furry friend. You’ll have a chance to learn animal CPR, take a pulse, bandage and splint and even how to help your pet if they are overheating. Although you will not receive any formal qualifications, this is a good starting point if you are interested in the area of animal health. Everyone can appreciate a cute canine or fluffy feline selfie, but have you got what it takes to immortalise them in a professional pet photograph or skillful sketch? Hear from our resident pet photographer and Animania Editor to see what the tricks of the trade are when it comes to capturing our pets’ best angle and shading your way to some pet art!